From home improvement projects to automotive applications, spray painting is a relatively simple way to get a durable, smooth, high-gloss coating on just about anything. Whether you are using a can of spray paint or an airless sprayer, you are bound to encounter occasional spray painting mistakes. Fixing these mistakes is possible and involves removing the undesirable paint and reapplying. 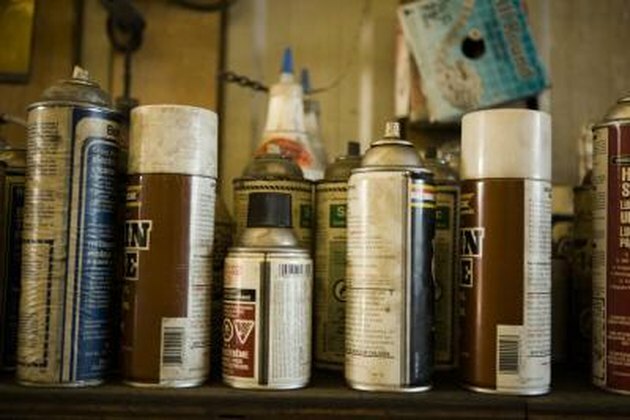 Old cans of spray paint will malfunction if improperly maintained and stored. Level the area with fine-grit sandpaper and buff with rubbing compound, if you must fix drippy sags and runs after the paint has dried. If the paint is still wet, smooth out the drips with a camel hair paintbrush. Reapply spray paint in light coats, keeping the sprayer or spray can constantly moving to avoid the same problem. Remedy rough "orange peel" areas. Allow the paint to cure, then sand until smooth. Keep the sprayer or spray can closer to the work surface as you recoat, so an undesirable "orange peel" texture does not recur. Eradicate "fisheyes" from your paint surface. These unsightly dimples result from surface contamination due to dirt, rust or moisture that has become trapped under the paint. Wet sand down to the primer or bare surface and clean thoroughly before reapplying paint. If paint is still wet, you can simply wash off the paint and clean the surface well. Always wash the work surface before spray painting to prevent this problem in the future. Repair "blobs" due to lumpy paint. Old, clotted paint and dirty spray nozzles can cause this issue. Simply sand the area smooth before reapplying paint. Mix paint thoroughly before using and clean spray nozzles properly after using to make spray paint blobs a problem of the past.